The New 22 1/2 Inch Bullet - Enjoy authentic smokehouse flavor at home with the Weber Smokey Mountain Cooker/Smoker. Though amazingly compact in looks, this smoker is equipped with two 22.5-in. grates that let you smoke both a turkey and a ham at once. At the bottom is a porcelain-enameled water pan that adds steam to the cooking process so your meat stays moist and tender. In front is a rust-resistant door that lets you add fuel easily and conveniently. 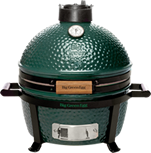 The grates are triple nickel-plated, the bowl and lid are porcelain-enameled and the handle is glass-reinforced nylon. Comes with a Weber cookbook and a premium-grade cover. Measures 41 x 19 x 19"